The International Polar Foundation (IPF) participated in the recent United Nations Framework Convention on Climate Change (UNFCCC) Conference of Parties (COP22) in Marrakesh, Morocco in Africa, starting just a few days after the Paris Agreement came into force in early November. The Paris Agreement was agreed at COP21 in Paris last December and aims to help countries work together to limit climate change and deal with its impacts. We set up our booth (see photo) and chatted to many interested delegates about the zero emission Princess Elisabeth Station which fits into the “Action” agenda of the conference. If a station can run from renewable energy in the extreme Antarctic environment, we propose that renewable energy can be used effectively in many, many different environments around the world. We also talked about the importance of polar climate change research and our climate change education work and enjoyed meeting some teachers and students and sharing ideas. On “Education day” we joined in with some talks and discussions about how education, both in schools and the wider community, can help shift people’s behaviour to a more sustainable way of living. Irina Bokova, Director-General of UNESCO, the United Nations Educational, Scientific and Cultural Organisation, said “There is definitely growing realization that education is not an ‘add on’ but an integral part of any strategy to combat climate change and the key to a green future”. Educators need to look at more than just a transfer of knowledge and focus on economic, environmental and social perspectives that help nurture empowered, critical, and competent citizens for a sustainable future. Two UNESCO/UNFCCC reports, “Action for Climate Empowerment: Guidelines for accelerating solutions through education, training and public awareness” and “PLANET: Education for environmental sustainability and green growth” were also launched on the education day. There was so much going on!! The main negotiations were in two huge marquees, but there were also lots of other talks, displays and press briefings. Pavilions showed information about different country’s culture, climate change issues and solutions. We particularly liked the African and Indian pavilions and the USA hyper wall. At another part of the site, civil society groups and companies had displays and activities, with innovations and best practise as well as traditional food, handicrafts and music, climate change art, photography and campaigns. There were many positive stories: we met Jamila Bargach (see photo), from a Berber village in Morocco, part of the Dar Si Hmad group who found a way to catch fog using nets to get fresh water. They won an award for this work. 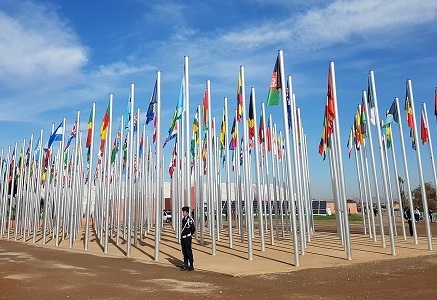 At the end of the two weeks, the Marrakech Action Proclamation signalled a shift towards a new era of implementation and action on climate and sustainable development. It also confirmed that our climate is warming at an alarming and unprecedented rate and that we have an urgent duty to respond. Many large companies said that they were already taking serious steps towards sustainability and moving towards 100% renewable energy. Governments have been setting targets for reductions in carbon dioxide emissions (called NDCs) and creating a large fund to pay for some of the work which needs to be done, and especially to help those countries which will be affected first. A group of the world’s 47 poorest countries called the Climate Vulnerable Forum agreed to generate 100% of their energy from renewable sources as soon as possible. This sets a clear example – what do you think that we should be doing in our own homes and communities? Learn about climate change and its impacts using the interactive Class Zero Emission multimedia animations and find out how you can reduce your greenhouse gas emissions at school and at home using our energy action sheets and send any other ideas or suggestions to us at edu@polarfoundation.org or tweet @polarfoundation and let us know about what you are doing!